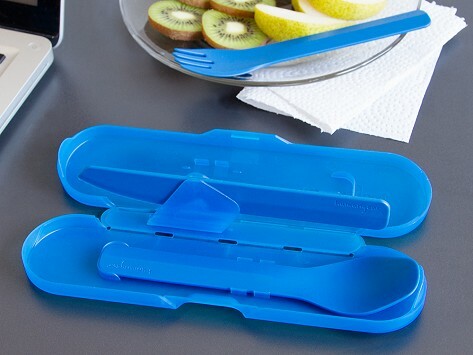 Plastic utensils woefully under-perform when you’re eating. And their disposable nature is a disappointment, too. Enter GoBites—a sturdy personal utensil set that is made to last. Use them at work, camping, traveling . . . anywhere you can replace the plastic throwaway kind. Dimensions (in packaging): 11" x 3.25" x 1"
Sturdy and super convenient for traveling! A good set to have in my lunch box. The knife really cuts. I like the quality and appearance. With their inquisitive way of reinventing the ordinary, humangear is happily making daily tasks less of a chore.